I just love the sight of a tall ship and it is a shame that we get to see very little of them here in Singapore, and so, I have to settle for that occasional visit to one that comes alongside every once in a while. 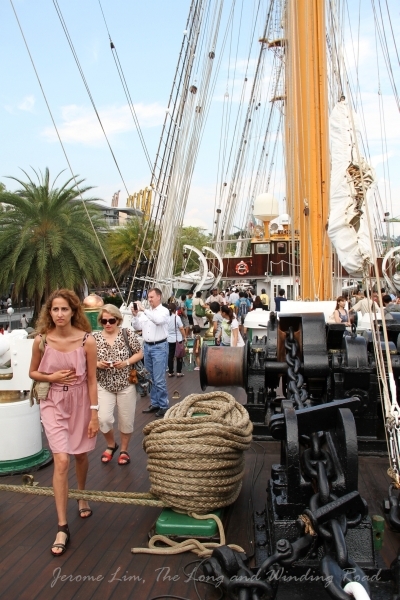 One such ship, the Chilean Navy training ship, the Buque Escuela (BE) Esmeralda, a four-masted barquentine, on a four-day visit to Singapore, was opened to the public over the weekend and I took the opportunity to pay a visit to it on Sunday. 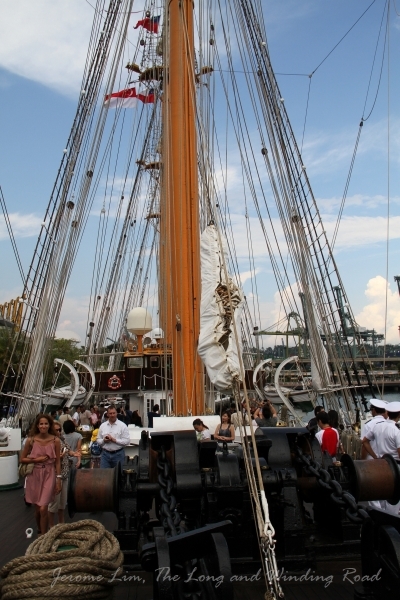 The Esmeralda, which means “Emerald” in Spanish, is affectionately known as “La Dama Blanca” or “The White Lady”, is currently on an eight-and-a-half month training voyage that will see her call at 13 ports in 10 countries – a voyage that started in her home port of Valparaíso on the 22nd of April this year and will end with her return to Valparaíso scheduled for 6th of January 2013. 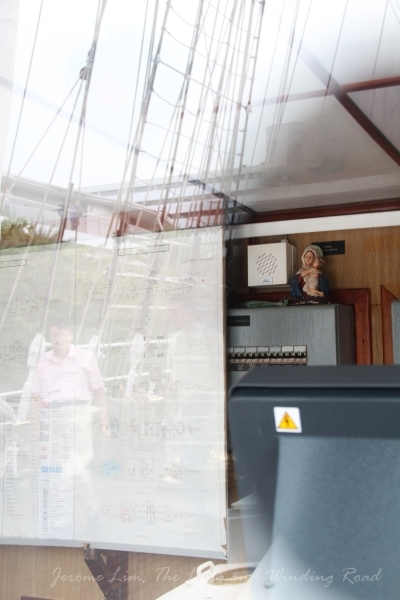 Singapore is her sixth port of call on the voyage which also sees her calling at ports in New Zealand, Australia, Indonesia, India, Israel, Turkey, Spain, Colombia, and across the Panama Canal in Ecuador. 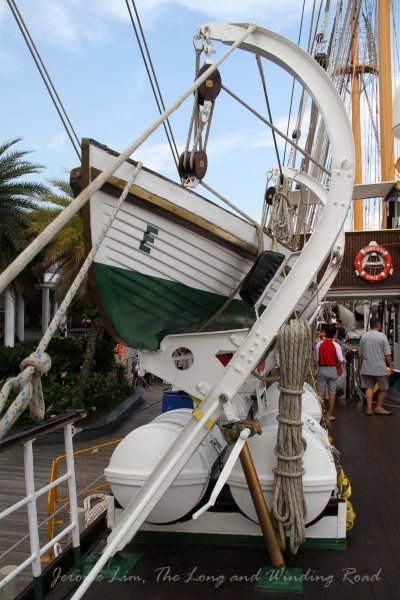 The BE Esmeralda seen here berthed at VivoCity is a four-masted training ship used by the Chilean Navy. The Esmeralda, launched at the Spanish shipyard, Astilleros de Cádiz, in 1953, has had a rather interesting history. When her keel was laid in 1946 at what had been the Astillero Echevarrieta y Larrinaga de Cádiz, she was to have been built as replacement for her sister ship, the Spanish Navy training ship Juan Sebastián de Elcano and would have been named the ‘Juan de Austria’. What followed was a series of events that led to the ship being transferred to the Chilean Navy. Construction on the ship was halted in August 1947 due to massive explosions at the shipyard which not only caused damage to the ship, but also resulted in such damage to the yard itself that it brought the yard to its knees. The yard was eventually rescued by the Franco government in 1951. The government formed the Society of Cadiz Shipyards (Sociedad Astilleros de Cádiz S.A.) which the shipyard came under when the takeover was completed in 1952. 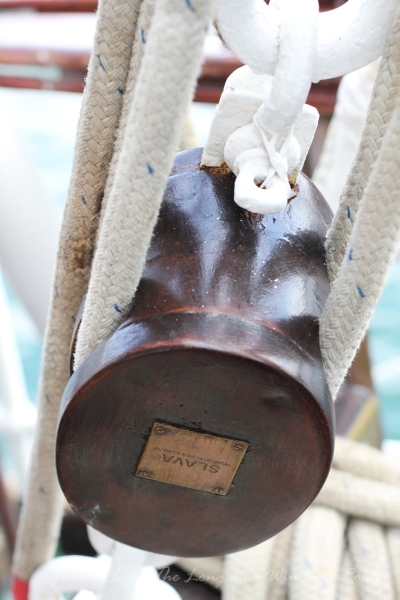 A manually operated capstan on the poop deck. 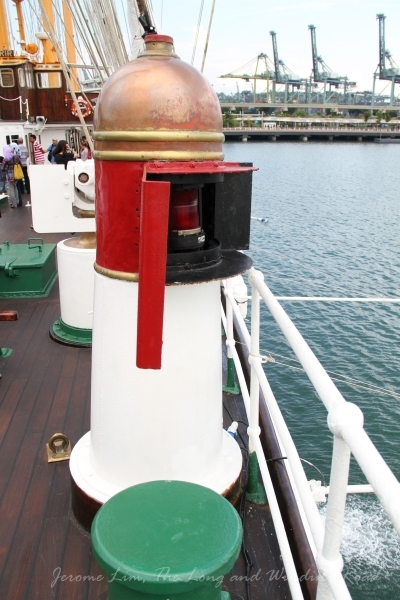 The capstans are marked with the words Astilleros de Cádiz – the shipyard that built the BE Esmeralda. Before the takeover was effected, Spain had entered into negotiations with Chile in 1950, on the repayment of debts it had incurred as a result of the Spanish Civil war, primarily from the import of thousands of tons of salt with a loan from the Chilean government. As Spain wasn’t in a position financially to repay the loan, an offer was made to repay this through manufactured products. This was accepted by the Chilean government and part of this included the transfer to the ship (approved in December 1951) which was valued at US$ 2.98 million. Construction then recommenced and the ship was launched on 12 May 1953 and christened the BE Esmeralda. She was finally completed some eight years after her construction was started and delivered on 15 June 1954 to the Republic of Chile, setting sail the following day. She arrived at her home port of Valparaíso on 1 September 1954 via Las Palmas, New Orleans, Panama and Tongoy. 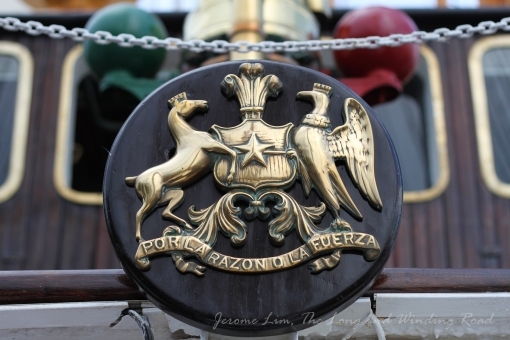 Helm on the poop deck – the words ‘Vencer o Morir’ or ‘Conquer or Die’ the motto of the Chilean Navy is inscribed on it. The Chilean Coat of Arms seen at the forward end of the deckhouse. 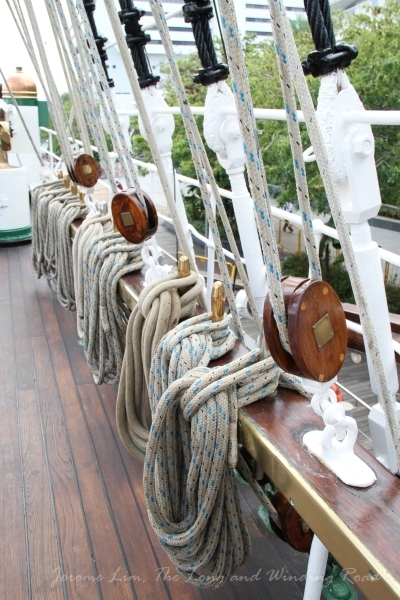 The ship is apparently the second longest tall ship with a length overall of 113 metres and a length (without her bowsprit) of 94.13 metres. 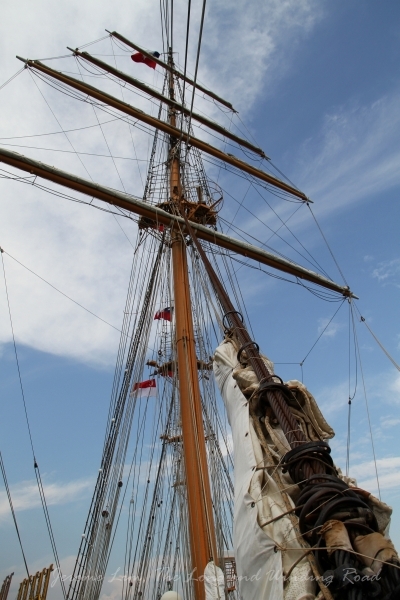 Her two main masts are just a metre shy of the main mast of the STS Pallada which I visited in March 2010 at 48.5 metres in height. The steel hulled barquentine displaces a maximum of 3,673 tonnes. 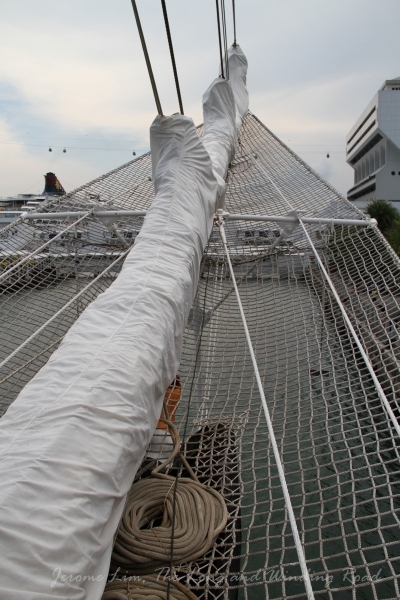 On its four masts and bowsprit, a total of 29 sails can be hosited, providing an total sail area of 2870 square metres and giving it a top speed with sails of 17.5 knots. More information on the very pretty ship can be found at the Chilean Navy’s page on the ship. 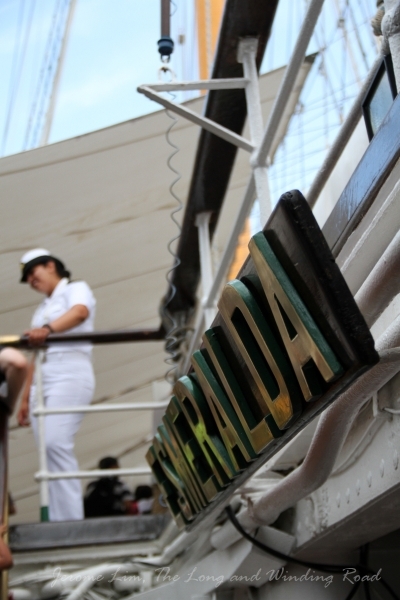 The Esmeralda set sail on 14 August and is scheduled to arrive at her next port of call, Mumbai, on 30 August 2012. When she arrives back in Valparaíso at the end of the training voyage on 6 January 2013, she would have travelled some 30,414 nautical miles, spending a total of 208 days at sea. 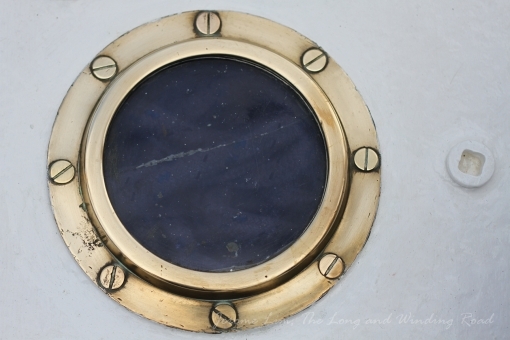 A porthole on a skylight. 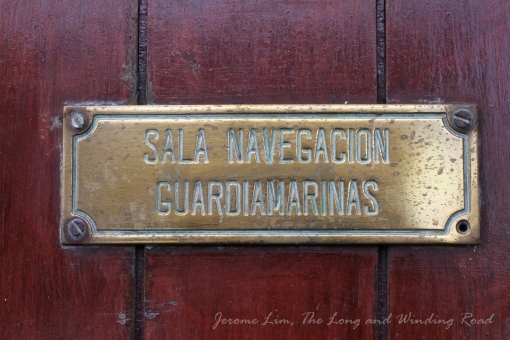 Brass nameplate for the door to the Midshipmen’s Navigation Room. 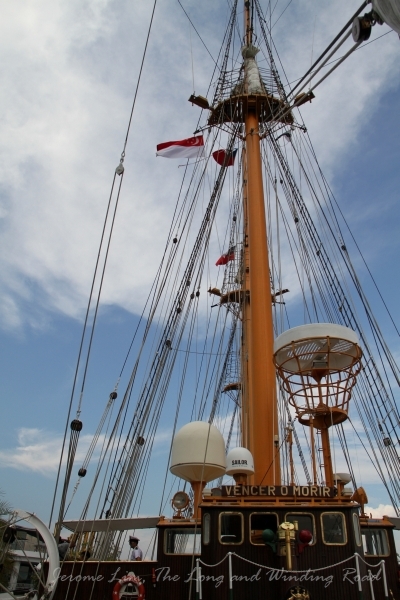 A view of part of the fore deck with the fore mast. The starboard anchor windlass and chain stopper. The forward main mast and the forward end of the deckhouse. 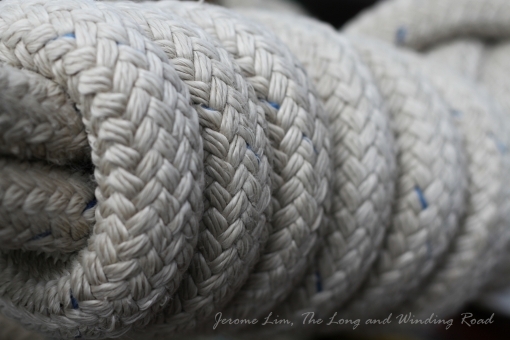 Part of the rigging on the gunwale. A tender on launching davits. 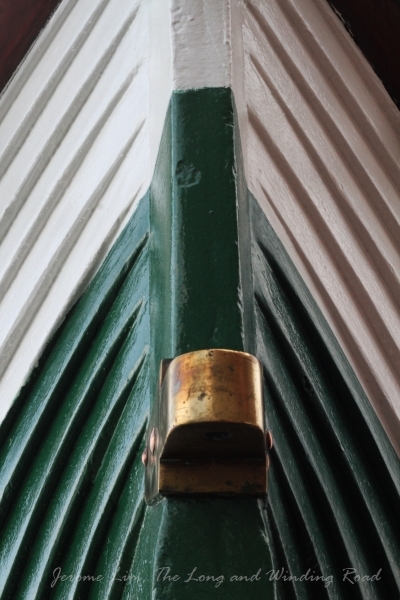 A peek inside the deckhouse. A cook in the ship’s galley. 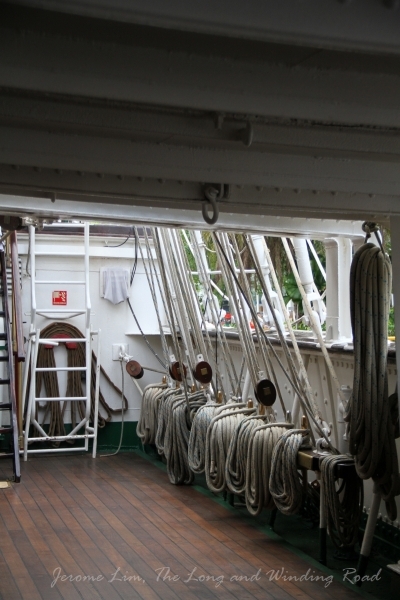 A view of the lower deck.